“Budapest is the most wonderful city imaginable. There is no other like it in the German Empire… However, from a historical standpoint, it is unforgivable that the most beautiful city along the Nibelung river should belong to the ancestors of Attila and his huns.” – Adolf Hitler once stated. In the winter of 1944, he himself gave an order to protect the city – each and every house – as a key military stronghold. What we see in the 130 photographs recently shared on Fortepanon is the result of this apocalyptic and completely senseless battle – as told through the ruins, the missing residents, the buildings, themselves. The military action to occupy the city lasted for 102 days. During the siege, around 28,000 civilians lost their lives – among them 15,000 Budapesters of Jewish descent. The Soviets not only lost 80,000 soldiers, but the number of their wounded approached 240,000. The number of German and Hungarian soldiers lost – including both those killed and injured – reached 100,000. 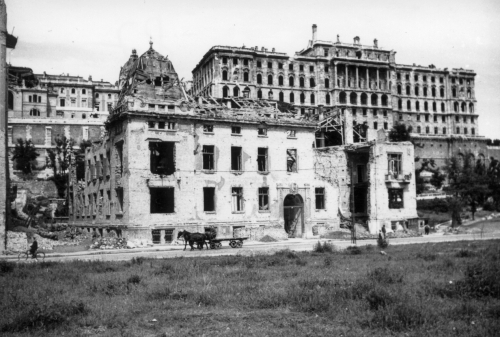 As a result of the siege, around a quarter of the city’s 40,000 buildings were either destroyed or seriously damaged. 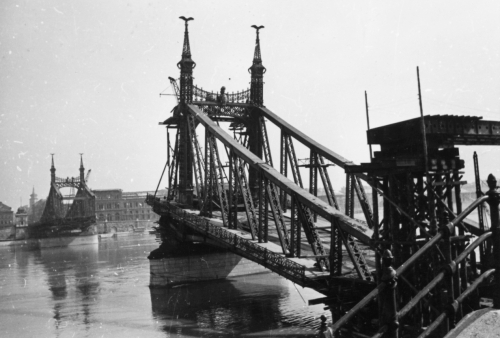 The Germans blew up all of the bridges across the Danube; entire squares disappeared, for example Honvéd Square and Szent György Square. The city was transformed into a mountain of corpses and, especially on the Buda side, a pile of debris. Furthermore, while the siege was going on, another war was also underway – the campaign of the Arrow Cross against the Jews of the capital city. Now we will try and jump over these 102 days, even if with this jump it will be harder to make sense of everything we see in these pictures. László Deseő, who was 15 years old in 1944, wrote about the fateful final/first days in his diary, writing from the basement of their Mészáros street house. The Russians are at the Preisengers’ place. That’s the third house down from here. At 5 o’clock, the Germans leave, because they heard that the Russians had surrounded them and were attacking from Naphegy. (…) 8:30. The Germans came back. At 9 the Germans went out again. The shelter emptied out. I snuck up to have a look around. The Germans are still in our apartment. There are dead horses in every direction. There is a faint aroma of blood and corpses, blending delicately with smoke. It is cold. Manure is knee-high in the rooms. It’s hard to see. (…) The Germans are standing around freezing. They’ve become soft. They even kindly remind me that if I don’t go back to the basement, they will kill me, since civilians are not allowed on the front line. I put them at ease with the fact that this won’t be the front line for long. They are reassured. Apparently, they burned down the Déli train station. At 11 o’clock the Germans will leave the house, perhaps for good. Either they will return, or the Russians will come. The Russians came in the morning. They were looking for schnapps [pálinka]. They didn’t find any, so they left. We hear more and more reports of Russians harassing women. (…) The Potzonyis come over in the afternoon. They told us how the Russians had taken everything from their place. When I was out in the street, a Russian put a demijohn in my hands and wanted to take me somewhere. The superintendent of the neighboring house came over. I gave the bottle to him, so the Russian took him away instead. I am curious as to where he took him. Anything that wasn’t destroyed by the Germans was plundered by the Red Army. Marietta Seidl remembered the destruction of their home on Gellért Hill in this way: “The Russians lived in the villa for more than half a year. During this time, they didn’t even clear away the rubble from the rooms that had been decimated by gunfire. When they suddenly moved out at the end of the summer, we were met with a horrifying picture. 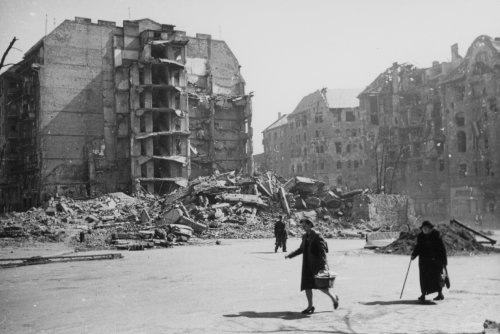 They took practically everything that they hadn’t burnt or thrown into the craters left by the bombs. They left no trace of the piano, the paintings, furniture, rugs – at least what they hadn’t already cut up for horse blankets or curtains for their trucks. And they also took 13 doors and altogether 72 window frames. (…) In all the rooms stood the meter-high remains of my grandfather’s library: a pile of human excrement then an open book placed on top of it, then a newer pile, and another book, stretching to such a height that, from a comfort point of view, it was incomprehensible to us. These towers decorated the rooms like skyscrapers standing next to each other, emanating the most unbearable odor. On December 30, 1944, Lieutenant-General Iván Hindy, the leader of the Hungarian armed forces in Budapest, reported, “The local patriotism of the civilians in Budapest is so great that the people are in mourning; they aren’t even worried about their own fate, but are in despair over the destruction of the city. Everyone is horrified by the thought that we might be forced to blow up all of the bridges. Maybe it is not so far fetched to think that these pictures might have been taken by such a local patriot. 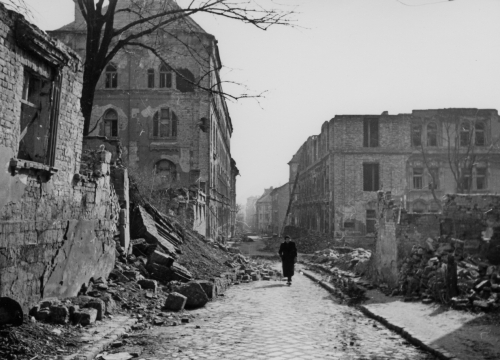 In such arresting detail, these photos are able to capture the state of the city – for the most part Castle Hill, the Víziváros district, and Gellért Hill – in the spring/summer of 1945. The dead bodies that were pulled out from under rubble or horses, from basements or from the Danube, have already been buried. We can see memorials to a few of them – temporary wooden crosses placed here and there in grassy areas and parks. We received the 130 photographs from Dr István Kramer, a lawyer. In the early 1970s, the photographer’s widow (unfortunately he no longer remembers her name) gave him the prints developed from the original negatives. The photographer might be unknown, but he/she is probably identifiable. There weren’t so many people who could have gone through so many of the streets of the resuscitated city in such detail. Tibor Csörgeő, János Kunszt, Tibor Inkey – maybe the photographer hides among them. What is certain: when the photographer was taking this series of pictures, he/she couldn’t have had any other thought than to capture the scene for posterity and reparation. 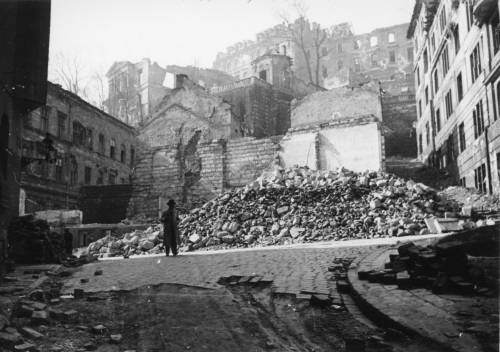 Perhaps this is why the style of the photographs seems to be without empathy, dry, and factual – and so, this is how Budapest looked in 1945.